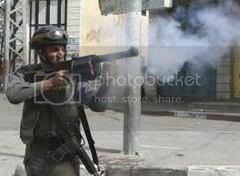 Palestinian medical sources in Hebron, in the southern part of the West Bank, reported Sunday that an infant died due to inhaling gas fired by the army at protestors in the nearby Beit Ummar town. The infant was identified as Hamza Samar Abu Maria, 18 months. The sources stated that the soldiers fired on Friday evening a gas bomb at the home of Abu Maria who was already suffering from dehydration. The infant was moved to a local clinic before he was moved on Sunday at dawn to a local hospital where he died shortly afterwards. The incident took place after clashes erupted between local youths and Israeli soldiers near Karmie Tzur illegal settlement installed on privately owned Palestinian lands, between Beit Ummar and Halhoul, north of Hebron. Soldiers fired dozens of gas bombs at the protestors inflicting several injuries. RAMALLAH, (PIC)-- A Palestinian boy on Thursday night died of a bullet wound to the back in the Wadi al-Harameyyeh neighbourhood of Beirzeit in the southern West Bank district of Ramallah. Palestinian medical sources told PIC correspondent that Aysar Yaser Fawwaz, 16, died after bleeding for three hours after being shot, at a late hour on Thursday evening, by a bullet that penetrated his back and lodged in his heart after Jewish settlers fired towards a group of Palestinian boys. The sources said that the boy was taken to the Ramallah government hospital and that his funeral is due to take place this afternoon. Local sources said that there were a number of boys from the village in the area and they were throwing stones when settlers opened fire towards them. Israeli police confirmed that they received reports of stone throwing and gunshots in the area and that they were investigating both. 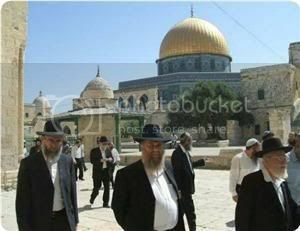 OCCUPIED JERUSALEM, (PIC)-- 45 Jewish rabbis stormed the holy Aqsa Mosque in occupied Jerusalem on Monday under strict security protection on the eve of the anniversary of the occupation of eastern Jerusalem in June 1967. Hebrew newspaper Yediot Ahronot said that the rabbis' step aimed at sending a message that despite indirect talks and the peace process they would not let go of Jerusalem as "the unified and eternal capital of Israel". It noted that the "visit", which has turned into an annual habit for the past three years, was the biggest as far as the number of participants is concerned. Dr. Sami Abu Zuhri, a Hamas spokesman, said that the storming of the holy site by fanatic rabbis was part of the Israeli judaization attempts of occupied Jerusalem and the Aqsa Mosque. He said in a statement on Monday that the increasing Zionist crimes against the Palestinian people and holy shrines was the natural result of the Arab and Fatah positions that went to negotiations despite persistence of Israeli crimes. The Israeli occupation's crimes are the natural fruit of the resumption of talks with Fatah faction, and prove the credibility of Hamas's stand that the negotiations would only serve as a cover for Israel to go ahead in its crimes against the Palestinian people and holy places. OCCUPIED JERUSALEM, (PIC)-- Dozens of savage Israeli settlers set fire to Palestinian homes in Al-Qurmi neighborhood in the Old City of occupied Jerusalem on Tuesday which led to the outbreak of clashes between the residents and the assailants. Eyewitness said that dozens of settlers holding burning torches and escorted by Israel troops stormed all of a sudden the neighborhood and threatened the residents to burn down all houses over their heads if they did not leave the area. The Palestinian residents tried to defend themselves in an attempt to protect their homes, but some of the settlers set some windows of the homes ablaze before fire trucks arrived one hour late to extinguish the fire. Al-Qurmi neighborhood connects between the areas of Al-Saraya and Aqabat Al-Khalidiya inside the walls of the Old City of Jerusalem and many settlement institutions have been trying for decades to lay their hands on the Palestinian real estate. In another incident, the Israeli occupation forces (IOF) burned hundreds of lash pastures in the foothills of Umm Al-Quba in the Jordan valley during a military drill in the area. Eyewitnesses said that the scorched lands are pastures used by nomadic herders living in the area, affirming that the troops during their drill deliberately burned the grazing lands in order to keep the nomads, who are regularly harassed, out of the area. For its part, the Palestinian ministry of agriculture reported Tuesday that the Israeli settlers and troops recently bulldozed and burned hundreds of dunums of agricultural lands in the West Bank and its villages. The ministry said that the latest of these violations was in the village of Jet located between Nablus and Qalqiliya, north of the West Bank, where dozens of settlers torched five dunums of agricultural lands owned by Palestinian citizens. It added that the IOF troops prevent many West Bank farmers from entering and working their lands, while the settlers wage daily attacks on the Palestinian citizens and farmers living near the settlements. The ministry also affirmed that the Israeli armored bulldozers destroy on a daily basis the agricultural lands located on the eastern and northern borders of the Gaza Strip. In separate incidents, different Palestinian local sources reported that the IOF troops kidnapped one citizen from the village of Husan in Bethlehem and two others from the village of Dura in Al-Khalil at dawn Tuesday. They also said that Israeli settlers threw stones and sprayed paint on Palestinian cars in the village of Tekoa, east of Bethlehem, without any reported injuries. A survey by an Israeli rights group shows that three out of four Palestinian children in al-Quds (East Jerusalem) live below the poverty line. The Association for Civil Rights in Israel said on Sunday that the majority of the 300,000 Palestinians, including 95,000 children, in al-Quds live in increasing poverty. The report also indicates that only one out of 10 Palestinians in the district has access to social services. Almost 160,000 others have no suitable access to the city's water and sewage network and 50km of main sewage lines are lacking, it added. The rights group blamed the desperate conditions of Israeli Arabs on Israel's decades-long policy of systematically neglecting and discriminating against Palestinians. "Israel's policy for the past four decades has taken concrete form as discrimination in planning and construction, expropriation of land, and minimal investment in physical infrastructure, government and municipal services," the report said. "A unified Jerusalem does not exist…The truth is, two cities exist side by side,” said the rights group, challenging Tel Aviv's claim that it unified Jerusalem after annexing the Arab sector in a move never recognized by the international community. Israel has seized more than one-third of the Palestinian land in al-Quds, on which it has built more than 50,000 homes for Israeli settlers. This is while very few Palestinian have managed to get a housing permit over the past decades. There is also a dire shortage of some 1,000 classrooms. Garbage collection is sporadic at best, and there are no regular postal services. A Gazan fisherman was killed early Wednesday morning after an Egyptian patrol boat forcefully collided with the fisherman's boat on the sea border between Rafah and Egypt. 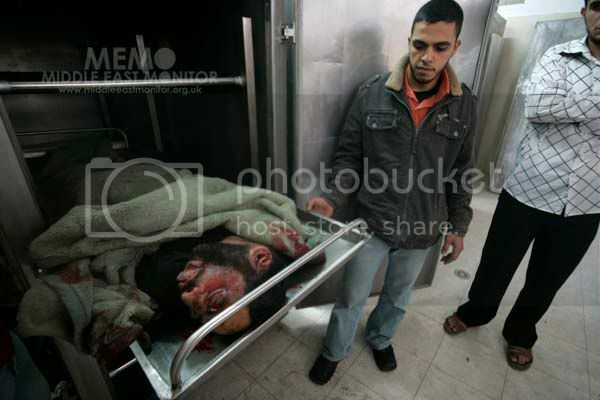 Mohammed Ibrahim al-Bardaweel (44 years) was killed and two of his relatives were seriously wounded. Witnesses said that Al-Bardaweel had been fishing in his engineless boat when the Egyptian boat rammed into it, injuring him and his two relatives, who were all taken to Abu Yousef al-Najjar hospital, where Al-Bardaweel later died. Their fishing nets were later confiscated by the authorities. This is not the first time Palestinian fishermen have been assaulted and harassed by Egyptian authorities while at sea. OCCUPIED JERUSALEM, (PIC)-- A report issued by the Jerusalem Center for Social and Economic Rights (JCSER) on Thursday states that the Israeli occupation ministry of interior withdrew the residency rights of 229 Jerusalem residents in 2007 and 4672 residents in 2008 as part of the occupation's policy of ethnic cleansing of Palestinians. The centre published on Thursday new data which it has received from the Israeli occupation ministry of interior regarding the numbers of Palestinian Jerusalem residents who lost their residency during the years 2007 and 2008. The centre pointed out that 67 residents regained their residency rights in 2007 and 83 residents regained their residency rights in 2008. JCSER added that the number of family reunification applications in 2007 were 750; 431 of these were accepted while the number of such applications in 2008 was 816; 404 of them were accepted. The number of applications to add a child to the blue ID card (given to Palestinian residents of occupied east Jerusalem) were 1881 in 2007; 1347 were accepted, while the number of such applications was 2062 in 2008; 1470 were accepted. The Israeli occupation authority has consistently worked to ethnically cleanse Jerusalem of its Palestinian population and these efforts have intensified in recent years. LUBBAN ASH SHARQIYA, West Bank, May 10, 2010 (IPS) - "There is immense anger as well as a feeling of vulnerability and fear when a place of sanctuary and holiness is subject to indiscriminate violence," says Issa Hussein. "Despite living under a brutal military occupation and being subjected to regular attacks by Israeli settlers for decades, normally places of worship were spared," Hussein, a spokesman from this Palestinian village, near Nablus, in the northern West Bank, told IPS. "People could forget about the economic hardship, the political oppression and their personal problems for a few hours a week as they retreated to pray in the mosque." All this changed dramatically for the agricultural village of 3,000 residents a few weeks ago. Israeli settlers from one of the three surrounding illegal settlements, which have been built on land belonging to Lubban Ash Shariqiya and other Palestinian villages, carried out an arson attack on the local mosque. The Israeli Civil Administration, which administers the West Bank, originally denied that Israeli settlers had been involved, and instead blamed an electrical short-circuit. However, Israeli fire-fighters who later came to investigate the gutted mosque said arson was the likely cause and ruled out the possibility of an electrical fire. "The part of the mosque where the fire broke out was undergoing renovations and the electricity had been turned off," explained Hussein. "Furthermore, some villagers heard cars drawing up at about 3 am in the morning of the attack and saw settlers getting out of the vehicles and going into the mosque," said Hussein as he took IPS on a tour of the charred and gutted mosque. Curtains from windows had been torn down to help the fire burn. Qurans, which are usually piled up at one end of the mosque, had been moved to the other end and placed in piles next to the bathroom. On top of, and adjacent to, the pile of Qurans were shoes which had all been arranged into a Star of David sign, Judaism’s chief emblem. Shoes are regarded as dirty in Islamic culture. One of the worst insults in the Muslim world is to show the soles of one’s shoes to somebody or to walk over something with one’s shoes on. The vandalism of deliberately attacking a holy place in a deeply religious society, combined with the use of provocative and offensive symbolism, was not lost on the villagers. "We would never store the Qurans near a toilet or put shoes anywhere near our holy books. Everybody is forced to take their shoes off at the door before they even enter the mosque," Hussein told IPS. This attack is just the latest in a string of attacks on Palestinians and their property, including mosques, as Israeli settlers up their "price-tag policy." 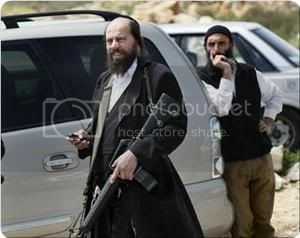 The settlers have warned that for every illegal settlement outpost dismantled, restraining order issued or settler arrested in the West Bank, they will carry out retaliatory attacks against Palestinians, their homes, places of business, motor cars, agricultural fields, livestock and mosques. Not a weekend goes by without Palestinians being assaulted, olive trees cut down or uprooted, fields set alight and cars stoned or burnt. 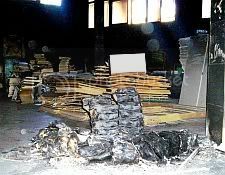 In December a mosque in the nearby village of Yasuf was gutted and burnt. In April Star of David and racist anti-Arab slogans were spray painted on a mosque in the village of Huwarra. Several cars were also set alight. In turn settlers driving near Palestinian villages have also been subjected to stone-throwing and periodic attacks with Molotov cocktails by Palestinians, damaging vehicles and in some instances causing injuries. However, Israeli Defence Forces investigators believe the attacks on mosques are part of a deliberate policy by settlers and have uncovered information about future settler plans to attack mosques. A number of settlers were arrested by Israel’s domestic intelligence agency, the Shin Bet’s Jewish department, but these arrests preceded more attacks on Palestinians. As of now it is not certain whether any charges will be pressed against those arrested. The U.N. Special Coordinator for the Middle East Peace Process, Robert Serry, condemned the settler attacks. "I condemn these attacks. It is vital that the Israeli government impose the rule of law and that those responsible for such crimes are brought to justice," said Serry. The special coordinator’s statement also expressed concern over "a number of attacks upon mosques in recent months, as well as violence against Palestinian property and individuals by extremist settlers." "This is not the first time we have been subjected to settler attacks. They have burnt our crops on a regular basis. They also machine-gunned to death an elderly man and woman in 1990 near out village after Meir Kahane was assassinated in New York," Hussein told IPS. Meir Kahane was the founder of the Jewish Defence League as well as the ultra right-wing and fascist Kach party which espouses the expulsion of Palestinians from Israel and the occupied territories. It was outlawed by the Israeli Knesset or parliament for being racist but it continues to attract supporters in Israel. Members of the Palestinian Authority (PA) visited Lubban Ash Sharqiya the same day that IPS was there and promised that the mosque would be rebuilt as soon as possible. PA President Mahmoud Abbas has personally ordered its reconstruction.